Michael Bastian – WHAT IS JAMES WEARING? Summer always finds me anxious to get out of town for a bit of rejuvinative green and nature. Thankfully I’ve been blessed with quite a few weekend invites to some of the most lovely places this summer. This weekend was no exeption as it brought a gorgeous getaway invitation to my super chic friend’s Hudson Valley country home, Wynkoop (more about this in our next post). En route to Wynkoop House we decided to rendezvous at the Carl Andre Exhibition at DIA:Beacon —- it’s just a quick scenic train ride from the city that affords some glorious views of the Hudson River along the way. 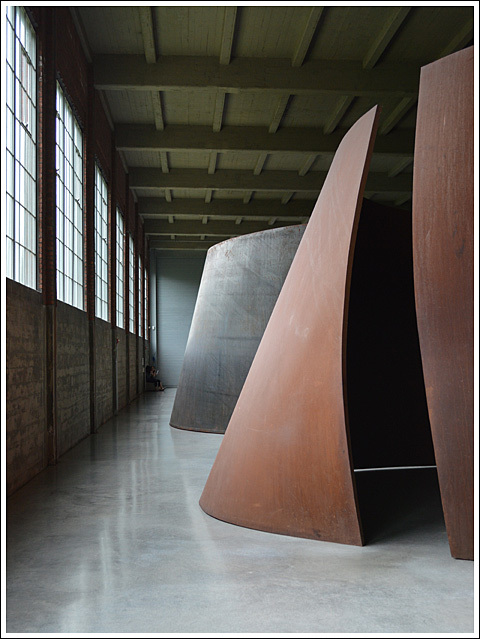 If you don’t know, DIA:Beacon is housed in a former Nabisco box printing factory with 300,000 square feet of the most perfect exhibition space illuminated by a spectacular 34,000 square feet of skylight—a perfect space to enjoy the equally spectacular installation of grand scale Serra sculptures there. The beauty of the place extends beyond the confines of the building into Robert Irwin’s gardens, where I stopped for a photo amidst ravishing rows of hornbeam hedge. For our art expedition, I’m sporting a Tom Ford era Gucci white linen jacket, Michael Bastian for Gant chartreuse cotton safari shirt, chartreuse silk pocket square from Charvet Paris, Tom Ford era Gucci olive python belt with silver double horse head buckle, white cotton shorts by Mario Matteo,Tom Ford woven olive suede espadrilles, a vintage Rolex and my fragrance is Creed Bois de Cedrat. I can’t believe it but the event of the season is already upon us – of course I’m referring to The Young Collectors Night at The Winter Antiques Show this Thursday evening January 30, 2014 7-9 PM at The Park Avenue Amory. If you have not secured your tickets – now is the time! Get your tickets online here. We were invited to a special preview recently and, as expected, the show is spectacular, with a marvelous range of objects to suit everyone’s fancy. Of particular note was the Arader Galleries showing — certainly one of the highlights of this year’s show. I’m wild about Frederick Judd Waugh’s 1932 “70 Degrees North” – a dramatic Arctic scene by one of America’s finest Marine painters. 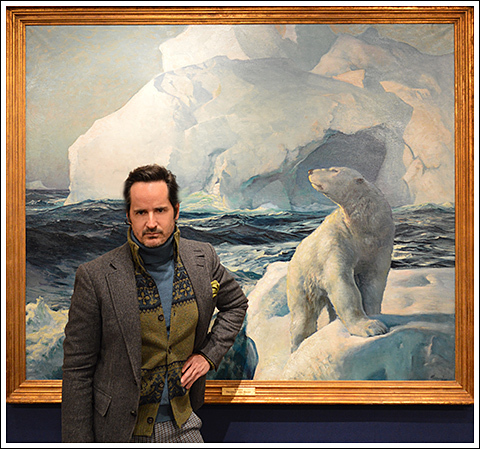 Waugh’s powerful depiction of the noble polar bear surveying his Arctic kingdom is truly sublime! And it’s just one of the many superb offerings you’ll find there. It goes without saying that we’ll be back on Thursday to have a more in depth look at many of the things that caught our eye — the event inevitably brings out the most gorgeous of the city’s glitteratti, and so we’ll be taking the opportunity to do some people watching as well! I’m sporting a Tom Ford charcoal wool/silk tweed country jacket, Michael Bastian chartreuse wool fair isle cardigan, cerulean blue cashmere turtleneck by Dolce & Gabanna, Gucci wool check pant, Lanvin green hightop sneakers, vintage Rolex, Charvet chartreuse silk pocket square and my fragrance Creed Royal Oud, Tom Ford – bronzing gel providing me with a glorious glow. James Andrew sur la plage. This past week has been wildly busy. Back home in the city, Scott McBee and I were already missing the sun and sand of Palm Beach so we made a mad dash to the nearest beach! And as expected, it did wonders to lift our spirits and touch up those nice tan lines we’ve been cultivating. It’s amazing what a little sun and fun away from the city can do. A bottle of rosé chilling in McBee’s ice box put the finishing touch on this blissfully beautiful day. 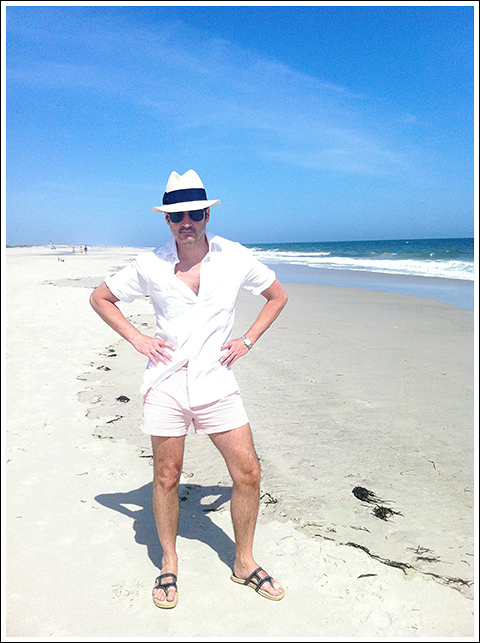 Dressed for a holiday in St Tropez, I’m sporting a Michael Bastian white linen guayabera style shirt, Tom Ford pink seersucker swim shorts and “Marco” sun glasses, Louboutin Espadrille sandals, Sugar Mill Harbor Island straw hat, and loads of sunscreen of course!